ASHTON DRAKE - PRECIOUS IN PEARLS 30TH ANNIVERSARY DOLL BY LINDA MURRAY. For 30 years, The Ashton-Drake Galleries has introduced some of the most realistic baby dolls ever created by the world's top doll artisans. Now, bring home the Precious in Pearls Baby Doll, a very special 30th anniversary tribute created exclusively for The Ashton-Drake Galleries by Master Doll Artist Linda Murray. This baby doll is so abundant in finely crafted details, including a 30th anniversary motif of freshwater pearls and an elaborate party ensemble, that she is issued in an edition strictly limited to 3,000 worldwide. Handcrafted in our signature RealTouch® vinyl to recreate every lifelike detail of Linda Murray's sculpting, this sweet So Truly Real® baby doll is hand-painted with realistic blushing and dappling. Her silky soft hair is hand-applied, and she wears a lustrous bracelet of cultured freshwater pearls accented with a golden 30th anniversary charm. Her festive ensemble includes a cream dress embellished with three tiers of ruffles, delicate embroidery and shimmering blue ribbon trim, as well as lace-edged booties and a matching headband. Her soft, matching baby blanket is trimmed with blue ribbon for the final touch. Brand new in the box. New never been out of the box. The item "Precious in Pearls 21'' So Truly Real 30th Anniversary Doll by Ashton Drake New" is in sale since Tuesday, February 16, 2016. 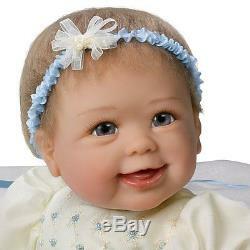 This item is in the category "Dolls & Bears\Dolls\By Brand, Company, Character\Ashton Drake\So Truly Real". The seller is "ger-dolls" and is located in Chatsworth, Georgia.